On the 20th of November, 1983, half the population of the United States of America tuned to ABC to watch the end of the world. It was a huge event. It was the biggest TV movie ever. A couple months ago I heard an NPR report about the 20th anniversary of The Day After, which depicted a nuclear war from the vantage point of the small towns and farms surrounding Kansas City, Missouri. The report concluded that the movie "hasn't held up," quoting a professor who said, "When I taught it, my students found it practically unwatchable." What those students didn't understand was that for those of us who were out of infancy in 1983, this wasn't just another media event. It was a test run for the day WWIII actually happened. We just wanted a preview of what we were in for. This is one of the big gaps between my generation and the one that followed, I think. In 1983, I was nine years old, and I knew I was going to die in a nuclear war. We all were, and we all knew it. Maybe it'd be soon, maybe decades later, but it was generally accepted as an inevitability. For those with ages in the double digits, a lot of the fear revolved around Ronald Reagan, who seemed to be itching to nuke the Soviets — hell, the man once announced on the radio that he'd initiated a first strike, and seemed to think this made for a funny, funny joke. Avoiding an ICBM exchange with the USSR seemed as likely in 1983 as avoiding another war with Iraq seemed in 2002: theoretically possible, but a losing bet. But me, I was just young enough not to know that this was anything new. I had no idea that Reagan had short-circuited decades of détente with his "Evil Empire" talk; I thought the US and USSR had been rattling their sabers nonstop since 1945, that we'd been on a four-decade lucky streak which couldn't last much longer. 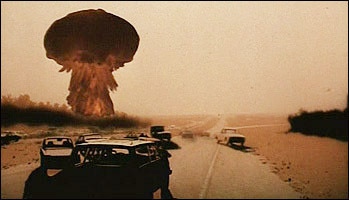 Maybe some of it was living in California: certainly I thought of nuclear war the same way I thought of earthquakes. The Big One, 8.3 on the Richter scale, was overdue — "It could happen in thirty years, it could happen tomorrow, it could happen today," said the seismologists on the news every week or two. Same thing with the bomb. We read short stories in reading class about the day the missiles flew. One day we were even given maps of Orange County and told to calculate how far away our houses were from the naval weapons station in Seal Beach, the most likely target in our area should the fateful day come. Shows like "Silver Spoons" and "Benson" had nuclear war episodes. The Day After was one of a slew of TV movies on the topic: Testament and Threads followed on its heels. Armageddon was the known endpoint we didn't even bother to deny. The best we could do was imagine that the post-apocalyptic struggle might not be so bad. Maybe plucky bands of survivors would pick up the pieces, stronger for the experience. Maybe, somewhere, in a quiet valley untouched by fallout, the human race could begin anew. I was actually expecting The Day After to go the "plucky band" route. I didn't remember much from 1983 — I don't think I even watched the whole thing, not at age nine, though I did remember the skeletons. Seeing it for the first time as an adult, I was surprised at how uncompromising it was. Life is perfectly normal, and then comes sudden panic, quick death for most, and lingering death for the rest. There are survivors, but no hope. Most will succumb to radiation sickness; the rest will starve. You couldn't put anything like this on broadcast television today — it'd be about heroic emergency personnel and America's renewed sense of purpose and so forth. And it's not that network executives were braver in the 1980s. It's just that this sort of hopelessness about the future was mainstream then. I doubt that many of the 100 million who watched thought they'd see 2004 before they saw mushroom clouds.